Rubber Band Loom Crafts: Easy Jewelry and More for Girls and Guys! Rubber band looms have taken the world by storm. If you're a teacher, parent, or anyone who's talked to a kid recently, you are probably more than aware of the rubber band jewelry trend that's dominating kids' crafts. Kids are always looking for more projects and Rubber Band Loom Crafts is here to help them create more crafts. 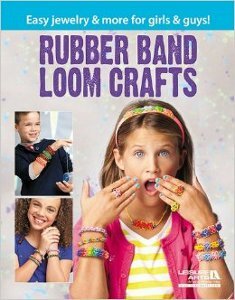 Whether your child uses a Rainbow Loom, Wonder Loom, FunLoom, Cra-Z-Loom, or one of the many other types of looms out there, he or she can do the jewelry tutorials in this book. Rubber Band Loom Crafts starts with a very basic pattern and then moves on the more difficult ones. It breaks down each project's steps into two parts. First, it shows you the band placement you'll need for the pattern along with pictures of how you'll set it up too. Then it shows you how you'll loop the bands with the loop tool, which will combine the bands together to make the necklace, bracelet, or ring. One of the best features of the book is the big graphics and thorough instructions. All of the instructions and their accompanying pictures are in large print so your child can easily see and read them. Rubber Band Loom Crafts not only break the projects down into two steps, but if a project uses multiple bands, they color coat each so your kid can easily see what they're supposed to do. They also have pictures of what the crafts look like once their complete. If your kid has a loom and is looking for more projects to take on this book is just for them. While jewelry is usually thought of as "girly", rubber band crafts are popular among young boys and girls. This book would make a great birthday present, holiday gift, or even an after-school surprise. Whenever you choose to give it to them, it will probably be met with fits of joy and excitement. I have seen my friends daughter make bracelets at our craft meeting. It looks like hours of fun.